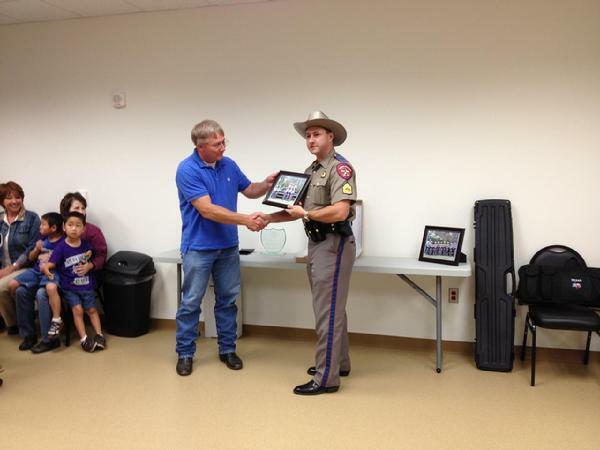 Sergeant Earl Vicknair with DPS gives Goodwin a framed Trooper photo at Goodwin's retirement party. 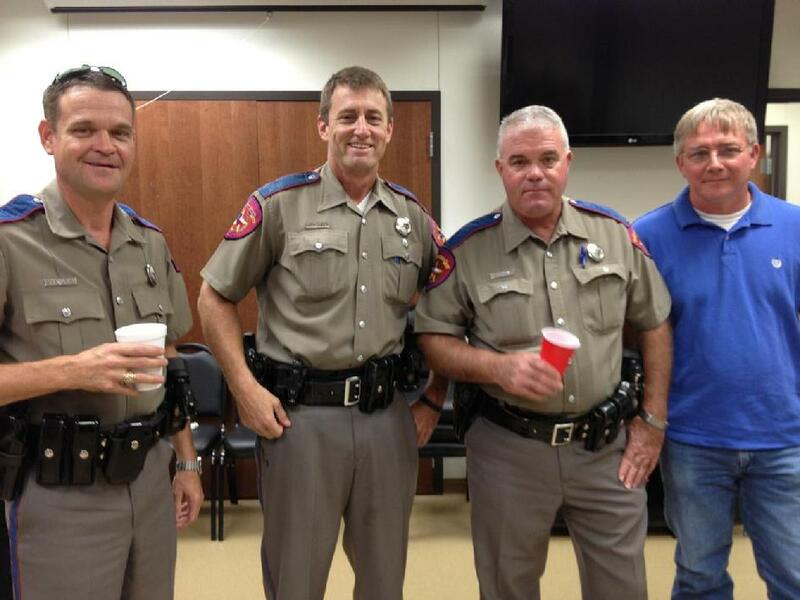 One of Polk County's Best Troopers Retires, LIVINGSTON, September 30, 2012 - After 24 years and 8 months, Trooper Glen Goodwin with the Texas Highway Patrol is calling it a career. A retirement party was held for Goodwin at the Polk County Sheriff's Office on Thursday, September 27, 2012. Troopers from Polk County and other countys in this part of East Texas were in attendance as well as other friends, family and local law enforcement. Goodwin spent the majority of his time as a Trooper in Polk County as Highway Patrolman. In his last few years with DPS, Goodwin changed job descriptions to Commercial Vehicle Enforcement (CVE). CVE focuses mostly on commercial vehicles such as 18 wheelers and other large commercial vehicles and the enforcement of safety and possible safety violations. 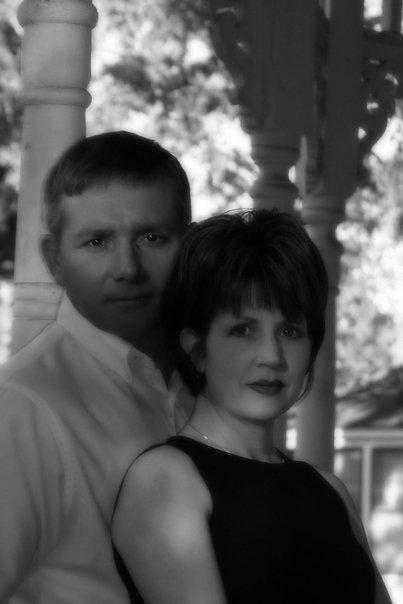 Glen and his wife of 23 years, Coleen, raised two children; Daughter Laurel, 22, and Son Jesse, 20. Laurel is studying at Sam Houston State University while Jesse recently joined the Army. Goodwin shows no signs of slowing down however. 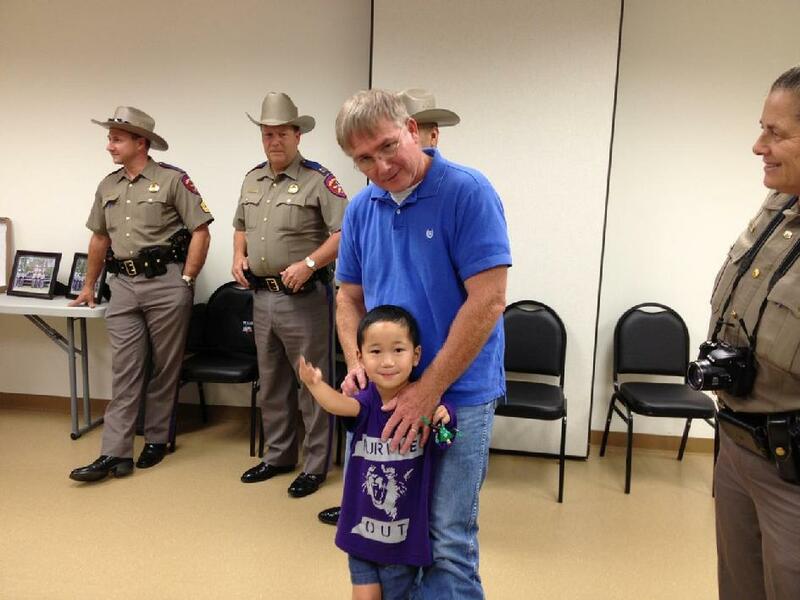 After having a successfully raised 2 kids, and a completed career with DPS, Goodwin has felt a calling to help needy children and is currently raising 3 special physical needs children from China. For retirement, Glen mostly looks forward to spending more time with his family. 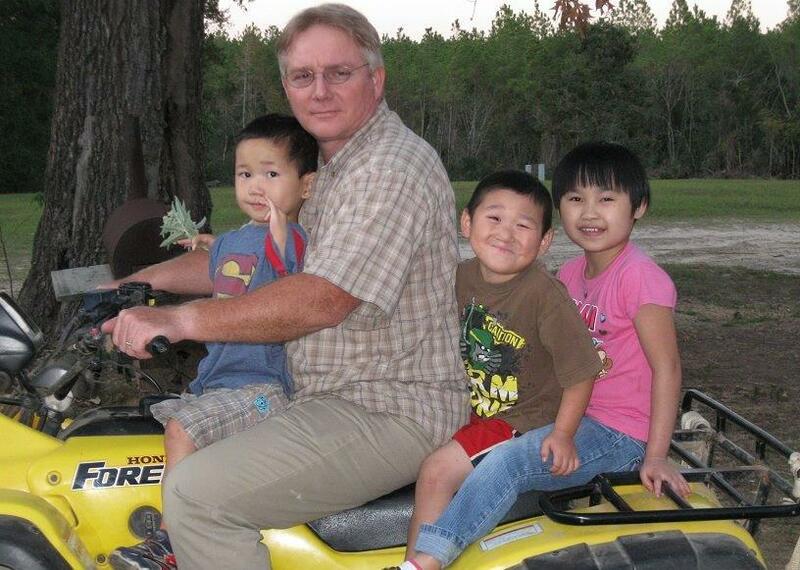 PolkCountyToday.com did a story in 2008 about Glen and his family adopting their first child from China. Glen with adopted son Zhen Zhen. A real family man, Goodwin was sure his family attended the occasion. Glen and Wife Coleen raised their own two children, and has since adopted 3 children from China. Glen with his adopted kids. (L - R) Zhen Zhen (Judah), Glen, Tong (Elijah), and Xiang (Delilah).